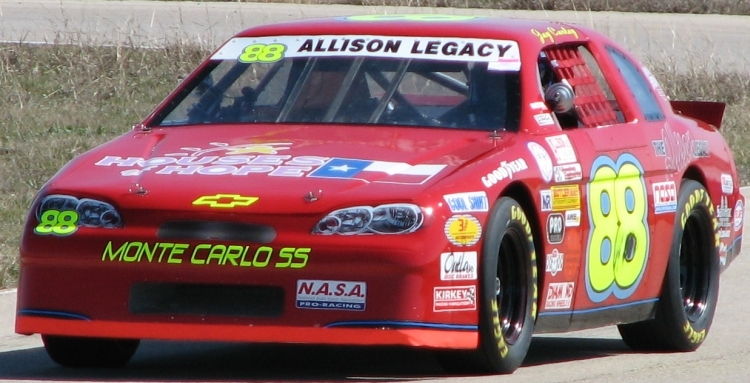 Yay, another weekend running the Alison legacy cars! Saturday morning at 0200 my alarm goes off and 15 minutes later I’m heading to the shop. 0240 and the truck and trailer is out and warming up and although it is cold outside, the lack of wind makes it bearable in my shorts (foreshadowing here folks…). 0245 and Rege and Eric show up and we load their gear with mine in the trailer and we hit IH35 about 0305 and I gently ease the hammer down as the two of them get some more sacktime. The duramax effortlessly pulling us northbound with the turbocharged engine’s intercooler probably close to maximum efficiency in this cold air. I had more power on tap than I could ever use and plenty more than simply pulling the crewcab truck and 30’ enclosed at 75mph. Sure we had two legacy cars and gear and spares and my golfcart and tools and everything else we could think to bring, but at that moment it was just me and the throttle gliding on the blacktop. The moon was out and the clear sky shone of distant stars as the towns arrived and departed silently in the chilled windows. After a quick stop for warm drinks we jumped off 35 and scooted over to Cresson just in time for the gate to open at 0700 and us to grab a paddock spot on the skidpad. We got Eric registered and since I had much to do, I didn’t register as I didn’t know if I would have had time to run and also crew and with a few projects of my own, money is tight. We got Eric out for the practice, which was a joke as they paired two large groups of cars together and it was a cluster of traffic. I don’t think Eric learned too much, but at least he knew where the track went. For the qualifying session I got the DL1 rigged with the onboard tire temperature sensors and pulled data for the session. It was interesting to see the plot of the inboard/middle/outboard tire temp versus lateral G and versus braking G and we learned a few things. I made the appropriate changes and Eric ran the first race. The second race would be later in the afternoon and would grid in their finishing order. Eric struggled with traffic but steadily got faster and was turning times that the AL guys turned their first trip here, but I know it was frustrating for him. New track, new tires, new setup and it was slow to come together. Rege and I were cold pretty much the whole time as the wind would just not stop and it blew right through us. I had on jeans and a pair of sweat pants and that was barely holding the invasive wind at bay. Rege’s trailer has an AC unit, but sadly no heater and the heat gun, while effective, was only good if you stood right in front of it. Last race of the day and Eric does a good job of going even faster and working traffic both faster and slower. He survived a few taps Saturday and brought the car home in one piece. A good hot meal and a good hot shower and we were all sleeping very early that night as the ‘been up since TWO’ was starting to take effect on me. Sunday dawned very bright but the view outside was a sunny mockery as the cold wind still drilled through us even as the sun tanned our exposed faces. I registered for the discounted (1 race) rate and went out for the one qualifying session. 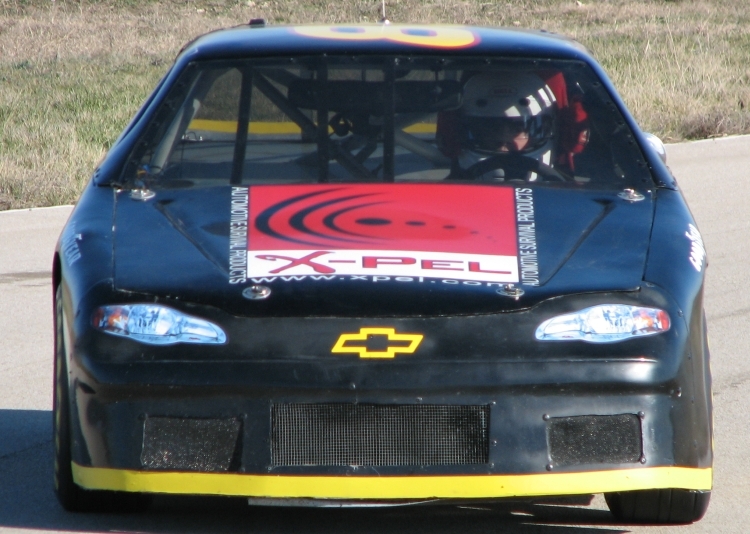 It was again packed with two groups’ worth of cars and I quickly realized that I had not driven the track in over 18 months and as the track came back to me I hoped the tires would too. The first few laps on a slick in that cold (25 degree?) are like ice and as the cars on R compounds quickly got heat in their tires I struggled. I was still fighting for clear track and getting faster when the session was over and I gridded 5th. Kirby was well on the pole by a large margin and then the next four of us were all within a half second or so and then it slowly tapered off. With 11 cars starting, I was mid-pack but I intended to change that at the drop of the green flag. The pace lap was uneventful as we all scrambled to put heat in the little goodyears. Most folks weave back and forth but I was accelerating and braking with little side to side movement. The braking puts more heat in quicker and heat is what we needed in this blustery cold and windy weather. As we begin to form up I notice that Kirby lines up on the RIGHT side. Argh. The first turn is BigBend and it is a left. Why he would line up on the right is beyond me, but the problem is that it lines me up on the right also. And with Kirby right next to the edge of the pavement I have nowhere to go if I can get a good start and begin to reel in Jay who is gridded in 3rd right in front of me. Sure enough, I time the start perfect and could have passed some folks but with nowhere to go I have to lift and go through BigBend in my slot. Argh. We scoot out of big bend and I got a good exit line and begin to move up with Jay (who also got a good line) and he passes #99 that was gridded in 4th (next to Jay). I get even with the 99 (I’m on the right still, just like the start) and then move slowly ahead of him in time for the braking for the Rattlesnake (biggest waste of pavement in North Texas) and I pass him clean and get into the first half of the right hand turn. As I am finishing up that turn and get ready to cut back to the left the 99 hits me (not real hard, but I’m on the edge now that the top 5 of us could all hide under one blanket) and sends me spinning. Thanks idiot. 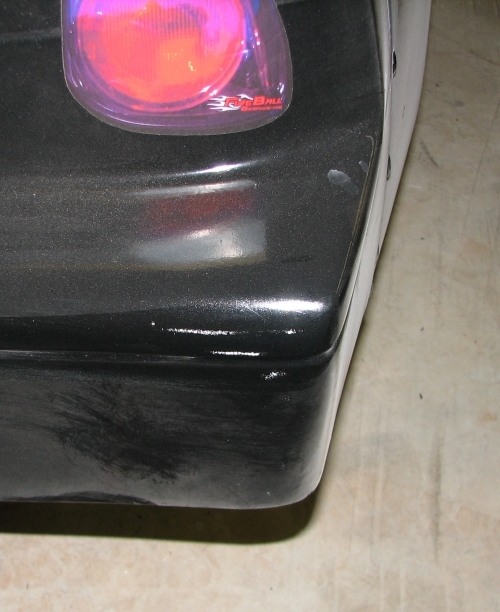 He hits my right rear (and of course, the first thing I think of is that Rege had JUST put a brand new bumper with fresh paint on it about 3 days ago). So the car rotates to the right and I tuck the front under to complete the spin and throw it in first, as I am nose-to-nose with the last 3 cars. I have to let them by and then take off in anger. I run that little car hard and start picking up spots immediately. The leaders are a good 7 seconds in front and I put my head down and go to work. When I get into the top 4 or so I catch Kirby as he is going pretty slow and then he picks back up again and passes me back and then sadly drops back again (he was having shifter issues and it ended up 6th). With the majority of the 40minutes gone the back end of the car was getting more and more loose. I was driving hard but fighting this looseness as I exited Big Bend to see Jay out front and going out the back of Rattlesnake and the 99 car just slowing for Rattlesnake. There was nothing to do but drive hard and since I was already doing that my mind thought ‘wow, if this is the last lap I’m going to have to settle for bottom spot on the podium’. Sure enough the flagman holds up the ‘1’ finger and I go to work Rattlesnake one last time and what greets me on the backside but a big old cloud of dust and the 99 car getting back on the track in front of me. Well shoot, there was virtually no way to catch him when I was down 6 seconds but now that he is only about a second in front of me there is a chance. The corners of my mouth twitch. This is going to be fun. Kirby's just-put-together Allison Legacy...extremely fast, but unfortunately with a few bugs to work out. A grin spreads across my face as I rocket through Ricochet heading to LittleBend with a touch more exit speed than 99. He gets through cleanly but again I have slightly better exit speed as we climb the hill with less than half a lap between us and the checkerflag. We make the slow right at BuzzardNeck and the gap is still pretty large, but possibly doable if I run a perfect HorseShoe/BootHill/Tombstone (three successive left handers that simply make one big arc that gets faster and faster) and BigBend. It may mean a banzaii pass coming out of BigBend, but at that moment I was pretty sure I could pull it off. Fortunately it was not needed. As I guided the little #33 back to the left to begin HorseShoe and my eyes were tracking the white 99 as he was midway through Horseshoe I saw his back end step out to the right and immediately knew he had too much throttle or too rapid a turn-in (or both) and that he was falling into my clutches. My grin was growing a bit as his mistakes compounded themselves as the car SNAPPED back straight and he launched off the track heading a solid 45degrees away from the direction he should be traveling. By now my teeth are showing through my grin as I run the arc and scoot down to BigBend one last time and take the checkerflag in 2nd. Jay won the race and Wess finished behind me to round out the podium. Eric coming off the track. Kharma. Yes. The guy who punted me and worked his way up to second eventually went off the track twice and lost second to me on the LAST LAP and I never had to touch him. Kharma. Just gives you a warm feeling inside don’t it? My ride for the day....THANKS REGE! After the race most of the Legacy drivers were hanging around one spot and Jay was deservedly happy. He drove a nice clean race and ended up on the top spot. I found the 99 driver and simply asked him what happened. At this point he didn’t know who I was and simply said ‘Oh, I went off the track trying to pass another car’, to which I said ‘no, what happened over there?” (pointing at the far part of the track). He quickly spit out a few ‘uh’s’ and said that he had missed a shift. He then asked me which car I was and I told him that I was the car he took out at the start. He lied and said it wasn’t him and that I must have been hit by someone else and blah blah blah. I told him I knew it was him because I had just passed him and folks on pit wall TOLD me it was him. After adamantly proclaiming he could not have hit me for a while he changed his story to ‘well, if I DID hit you, it wasn’t very hard’. HAHAHahahahahah. I laughed at him and he changed back to the first story about never hitting me. I then asked him why I had white paint on the corner of my back bumper. In true ‘it wasn’t me’ fashion, he said ‘it must have been another white car’. By now I was shaking my head and saying ‘Whatever dude, but think about this’ as I looked him in the eye, ‘you took me out to move up and got all the way to second and then I ended up second with you going off on your own on the last lap…kharma’. He was still babbling about not hitting me as I walked away laughing at him. In reality all I wanted was an apology. Just a simple look me in the eye and shake my hand and say ‘dangit, I really didn’t mean to get into you and I’m sorry’ to which I would have easily let it go and said ‘you know, it was a busy start and its ok’. I wasn’t looking to hold anyone’s feet to the fire or anything but by flat denying that he did it was pure crap. I don’t like running with folks like that. All racers make mistakes and I have no problem with that (I’ve been on the giving and receiving of apologies…no biggie) but to flat out lie is bogus. I’d much rather not race with that kind of person. Not a LOT of white paint...just enough to make you spin when you are on the limit in a corner. Jerk. So in the end both cars were loaded with only some very minor cosmetic scrapes (Eric had gotten hit and then the driver came and found him and apologized…wow, what an honorable and noble thing! <gasp>) and we made the trek back over to 35 and down to San Antonio. Eric steadily got faster the whole weekend and is beginning to push the car pretty hard now. He still has a little ways to go, but he was turning laps of about the same times as what most of the AL guys were turning their first trip to MSR-C also. It had been a long cold weekend but we had a lot of fun too. Next up, the long course at TWS running clockwise (backwards).